As I type this, I’m ensconced in a basement Starbucks in Chicago, still trying to figure out what time it is. My computer says one time, my phone another and my watch (remember those?) a third. Take your pick… It’s been a busy but amazing week. As I was sitting in the Dallas Fort Worth airport at 3:45 am this morning lamenting the lack of an open coffee shop, I paused to think about all the things that I didn’t do in Dallas during my visit their this week. Try on boots or a cowboy hat? Um, not either of those. Visit the Book Depository or the Cathedral? Unfortunately not. But the truth is, my visit to Dallas (actually Irving, in the Diocese of Dallas) couldn’t have been better. This is my fourth time to attend and present at the University of Dallas Ministry Conference. As the Dallas Morning News noted, this opportunity just keeps getting better and better! I had the pleasure of learning from The Most Rev. J. Michael Miller, Archbishop of Vancouver, gave a stirring keynote on Evangelii Gaudium. Do yourself a favor and buy a copy here. I had never heard Archbishop Miller speak before. I can share that I’m now a huge fan. As a student of “The Joy of the Gospel”, it was all I could do to contain myself as this shepherd broke open such a beautiful message of hope for over several thousand of his flock, doing so in a way that was clear, uplifting and filled with spirit. I met Catholic school principals, deacons (and their wives), religious sisters, teachers and catechists, ministry volunteers of all ages, and so many priests I stopped counting. These were amazing people of all ages and backgrounds who gave up three days of their time to worship, to witness and to learn. One long term volunteer told me that she plans a year ahead to take the week off so that she can always come and help. Her story echoes so many of the cool folks I met who have made this a priority. I think that’s why it’s growing by leaps and bounds. It was a great honor to give my first “Grace of Yes” talk since the release of the book for this audience of amazing yes-sayers. To say that I was humbled to stand before them and share a bit of my story would be a major understatement. I met several awesome members of the University of Dallas and Diocesan chancery staffs. Each was friendly, patient and filled with energy. I teased organizer Oscar Carranza, director of marketing and events for the university’s School of Ministry, that he must certainly have a clone to have pulled off such a fantastic event. And while I don’t think I formally met him, I sat in the room and watched Bishop Kevin Farrell (who tweets HERE) pause his work on his iPad to greet and interact with countless people. I do believe he spent the majority of those three days interacting with the faithful at the convention center. And he seemed to truly enjoy it! Even our shuttle bus driver was cool – a “driving rodeo” champion! So while I didn’t meet any cowboys, I can verify that I had several great conversations with a lady my age who is real “bus roadeo” contender! The people I met this week most certainly “made” Dallas for me. Sorry I missed an opportunity to see you in Dallas with conflicts in my schedule during UDMC. 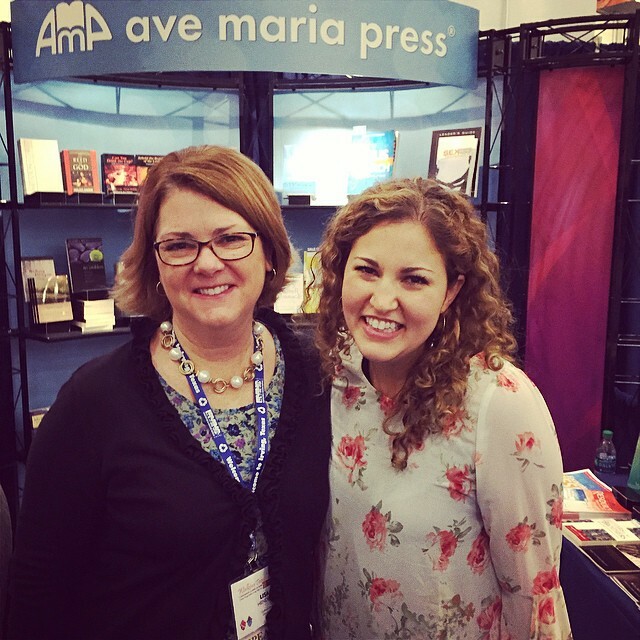 It’s a great conference and I’m sure your talk was as inspiring as the one you gave at Catholic Writers Conference, which still warms my heart!